Lonnie Wheatley, DODGE CITY, Kan. (August 25, 2018) – J.D. 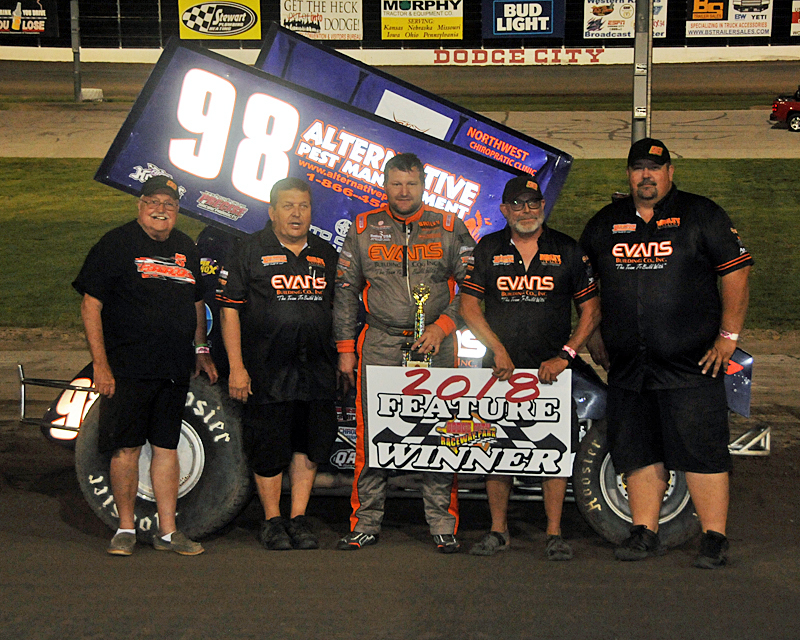 Johnson made a long awaited return to Dodge City Raceway Park’s victory lane by storming to the checkered flag in Saturday night’s 20-lap Precise Racing Products DCRP Sprint Car feature atop the 3/8-mile clay oval. 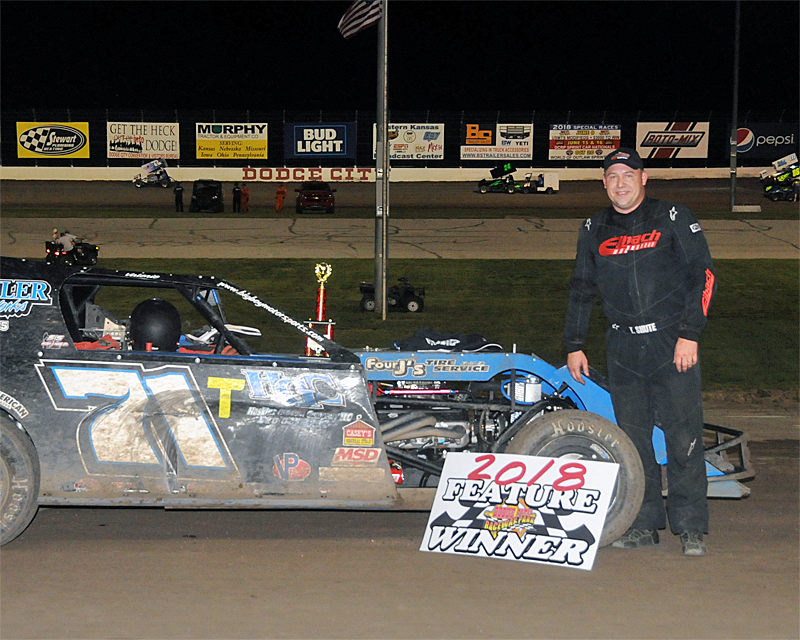 While Johnson posted his first DCRP win since 2013, Iowa’s Todd Shute bested the IMCA Modifeds, Jarett Lunow captured his first IMCA Sport Modified in, Tyler Tipton topped the IMCA Stock Cars and Duane Wahrman won in the IMCA Hobby Stock ranks. In the 20-lap DCRP Sprint Car feature, Goddard’s Johnson slid past two-time and reigning track champion Taylor Velasquez on the sixth round and led the rest of the way to pick up the victory aboard the Evans Building Company/Alternative Pest Management No. 98 entry. With Johnson racing through traffic over the last half of the event, Luke Cranston worked past Velasquez on the 17th lap and settled for a runner-up honors a half-dozen car-lengths behind Johnson. Velasquez lost a powerplant as the white flag flew, handing the third position to Ray Seemann with Koby Walters and new track points leader Steven Richardson rounding out the top five. In the 20-lap IMCA Modified feature, Des Moines’ Todd Shute mad the most of his first DCRP visit by making his way to victory lane. It wasn’t without a battle though, as a four-way battle between William Nusser, Jesse Smith, R.C. Whitwell and Shute ensued. Whitwell’s chances ended after contact with Nusser as Shute took advantage of the lead duo to take command on the 17th circuit. Shute paced the final circuits to take the checkered flag ahead of Nusser and Smith with Jesse Hoskins and Kevin Gray rounding out the top five. 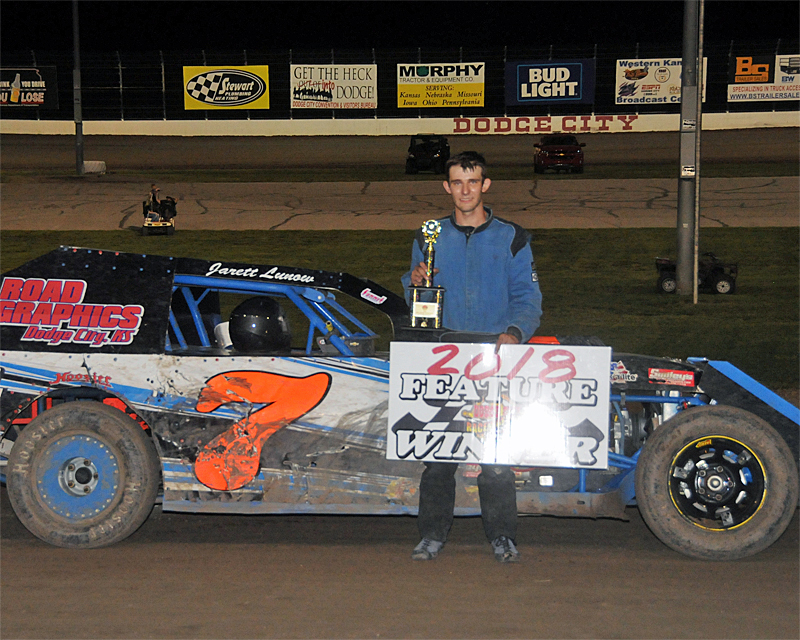 In the 15-lap IMCA Sport Modified feature, Dodge City’s Jarett Lunow capitalized on his father’s late-race misfortune to notch his first DCRP win in the Sport Mod ranks. Mike Lunow led from the outset and paced the field until sliding to the infield with mechanical problems less than three laps shy of the checkered flag. Jarett Lunow assumed command and held off Daylon Bergeron over the final three circuits with Jeff Kaup, Kaleb Roach and Bart Baker rounding out the top five. 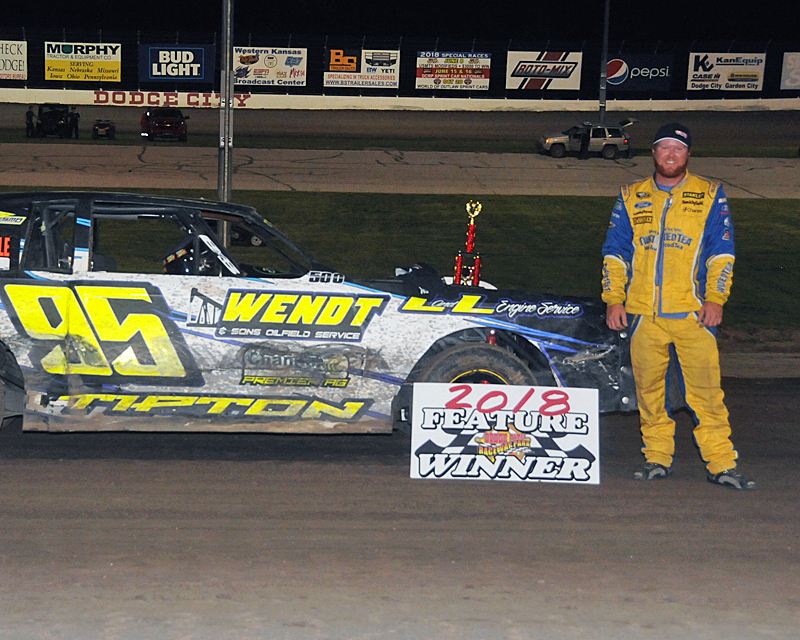 In the 12-lap IMCA Stock Car feature, Weskan’s Tyler Tipton battled past Ondre Rexford for the point on the fourth round and led the rest of the way for his first DCRP win July of last year. Tipton raced to the stripe ahead of Rexford with Chris Oliver, Dusty Witthuhn and Michael Pepper rounding out the top five. 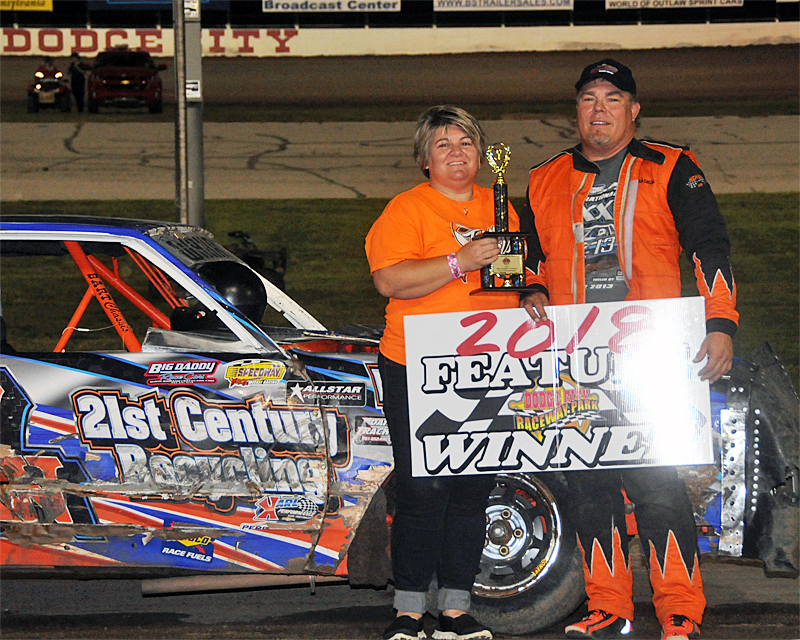 In the 15-lap IMCA Hobby Stock feature, Duane Wahrman raced into the lead on the fourth circuit and checked out on the field to post his fourth win of the year. Wahrman cruised to the stripe ahead of Reagan Sellard with Dion Priddy, early leader Jacob Huse and Danny Schulte rounding out the top five. Action continues at Dodge City Raceway Park next Saturday night, September 1, with a full card of championship chase action including Precise Racing Products DCRP Sprint Cars, IMCA Modifieds, IMCA Sport Modifieds, IMCA Stock Cars and IMCA Hobby Stocks. Heat One (8 Laps): 1. 98-J.D. Johnson, 2. 49x-Luke Cranston, 3. 0-Steven Richardson, 4. 11k-Tyler Knight, 5. 7-Shane Sundquist, 6. 51r-Ross Essenburg, 7. 911-Ty Williams (DNS), 8. 18-Brandon Sprott (DNS). Heat Two (8 Laps): 1. 28-Tracey Hill, 2. 95-Buddy Tubbs, 3. 17x-Kade Hagans, 4. 97-Brian Herbert, 5. 49-Kris Moore, 6. 1x-Cody Lampe, 7. 9d-Lance Davis, 8. 91-Christian Shriver (DNS). Heat Three (8 Laps): 1. 21x-Taylor Velasquez, 2. 72-Ray Seemann, 3. 33-Koby Walters, 4. 88J-Jeremy Huish, 5. 10-Jordan Knight, 6. 8J-Brandy Jones, 7. 24-Cody Hays. “A” Main (20 Laps): 1. 98-J.D. Johnson, 2. 49x-Luke Cranston, 3. 72-Ray Seemann, 4. 33-Koby Walters, 5. 0-Steven Richardson, 6. 28-Tracey Hill, 7. 10-Jordan Knight, 8. 88J-Jeremy Huish, 9. 11k-Tyler Knight, 10. 49-Kris Moore, 11. 1x-Cody Lampe, 12. 97-Brian Herbert, 13. 7-Shane Sundquist, 14. 21x-Taylor Velasquez, 15. 8J-Brandy Jones, 16. 9d-Lance Davis, 17. 51r-Ross Essenburg, 18. 24-Cody Hays, 19. 17x-Kade Hagans, 20. 95-Buddy Tubbs (DNS), 21. 911-Ty Williams (DNS), 22. 91-Christian Shriver (DNS), 23. 18-Brandn Sprott (DNS). Heat One (8 Laps): 1. 57-Joel Lane, 2. 71T-Todd Shute, 3. 26-Tom Beavers, 4. 71-Jesse Hoskins, 5. 1n-Nick Link, 6. 12-Kevin Tabor, 7. 88J-Jack Kirchoff. Heat Two (8 Laps): 1. 96-R.C. Whitwell, 2. 25-Kale Beavers, 3. 7n-William Nusser, 4. 01-Jesse Smith, 5. 16-Kevin Gray, 6. A2-Randy Wilson. “A” Main (20 Laps): 1. 71T-Todd Shute, 2. 7n-William Nusser, 3. 01-Jesse Smith, 4. 71-Jesse Hoskins, 5. 16-Kevin Gray, 6. 25-Kale Beavers, 7. A2-Randy Wilson, 8. 1n-Nick Link, 9. 12-Kevin Tabor, 10. 88J-Jack Kirchoff, 11. 26-Tom Beavers, 12. 96-R.C. Whitwell, 13. 57-Joel Lane. Heat One (8 Laps): 1. 7-Jarett Lunow, 2. 92-Jeff Kaup, 3. 5r-Kaleb Roach, 4. 8-Brian May, 5. 65-Kohl Ricke, 6. 12d-Brad Johnson, 7. 10-Alex Wiens. Heat Two (8 Laps): 1. 44-Mike Lunow, 2. 4-Freddy McCoy, 3. 4p-Daylon Bergeron, 4. 37-Bart Baker, 5. 18-Kyle Wiens, 6. 28k-Ryan Kirchoff, 7. 3s-Adam Stenzel. “A” Main (15 Laps): 1. 7-Jarett Lunow, 2. 4p-Daylon Bergeron, 3. 92-Jeff Kaup, 4. 5r-Kaleb Roach, 5. 37-Bart Baker, 6. 18-Kyle Wiens, 7. 3s-Adam Stenel, 8. 4-Freddy McCoy, 9. 12d-Brad Johnson, 10. 28k-Ryan Kirchoff, 11. 65-Kohl Ricke, 12. 44-Mike Lunow, 13. 10-Alex Wiens, 14. 8-Brian May. Heat One (8 Laps): 1. 95-Tyler Tipton, 2. 20-Tyler Walker, 3. 3-Chris Oliver, 4. 97x-Ondre Rexford, 5. 10-Dusty Witthuhn, 6. 33-Marlin Hogie, 7. 22p-Jack Pepper, 8. 22-Michael Pepper, 9. 94b-Brandon Ballard. “A” Main (12 Laps): 1. 95-Tyler Tipton, 2. 97x-Ondre Rexford, 3. 3-Chris Oliver, 4. 10-Dusty Witthuhn, 5. 22-Michael Pepper, 6. 20-Tyler Walker, 7. 22p-Jack Pepper, 8. 94b-Brandon Ballard, 9. 33-Marlin Hogie. Heat One (8 Laps): 1. 17w-Duane Wahrman, 2. 2m-Matt O’Hair, 3. 11-Joshua Reece, 4. 45p-Ryan Penrod, 5. 55-Jacob Huse, 6. 24b-Sheri Berger, 7. 19-Brett Copeland. Heat Two (8 Laps): 1. 2s-Reagan Sellard, 2. D68-Dion Priddy, 3. 12r-Brooke Russell, 4. 81d-Mike Davis, 5. 69-Danny Schulte, 8. 7-Tom Reed. “A” Main (15 Laps): 1. 17w-Duane Wahrman, 2. 2s-Reagan Sellard, 3. D68-Dion Priddy, 4. 55-Jacob Huse, 5. 69-Danny Schulte, 6. 11-Joshua Reece, 7. 24b-Sheri Berger, 8. 2m-Matt O’Hair, 9. 81d-Mike Davis, 10. 7-Tom Reed, 11. 45p-Ryan Penrod, 12. 12r-Brooke Russell (DQ), 13. 19-Brett Copeland (DNS).